H P Lovecraft, although not commercially successful during his lifetime, did influence a lot of writers and artists. You may have heard of "The Lovecraft Circle", which was a bunch of writers who befriended him and were inspired in one way or another by his work. 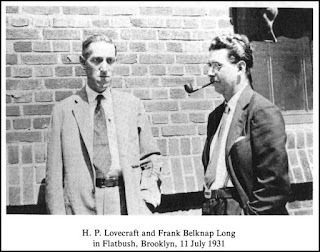 One such circle member was Frank Belknap Long, or "Belknapius", as Lovecraft nicknamed him. 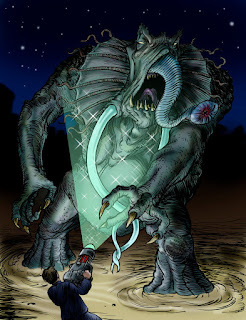 Long's most famous story may be "The Hounds of Tindalos", which you can find in numerous anthologies, and which has been included in the so-called Cthulhu Mythos. 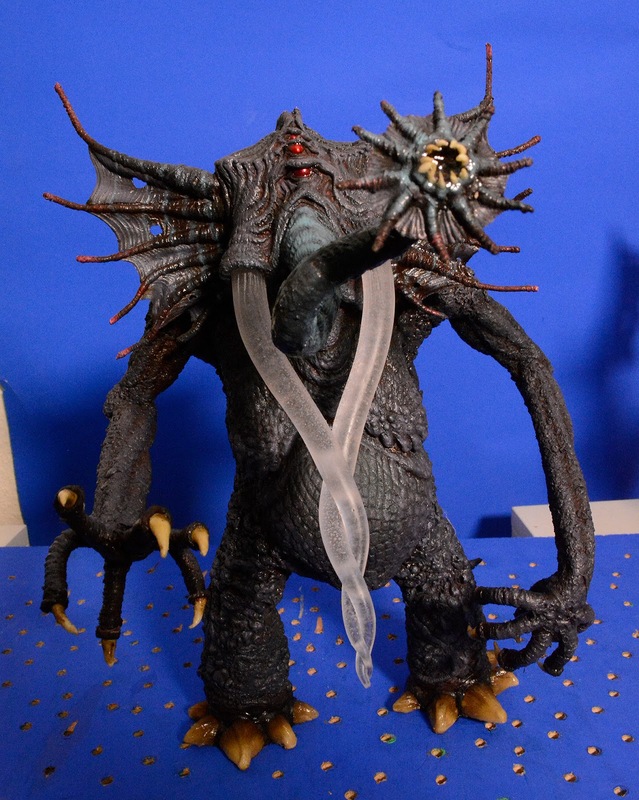 But he also wrote other types of horror and a fair amount of scifi. 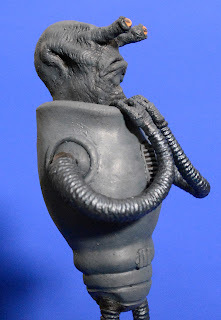 It's generally thought that Long was not as accomplished a writer as HPL, but he was more successful in his day, and I think his prose may be more accessible to a modern reader than Lovecraft's. 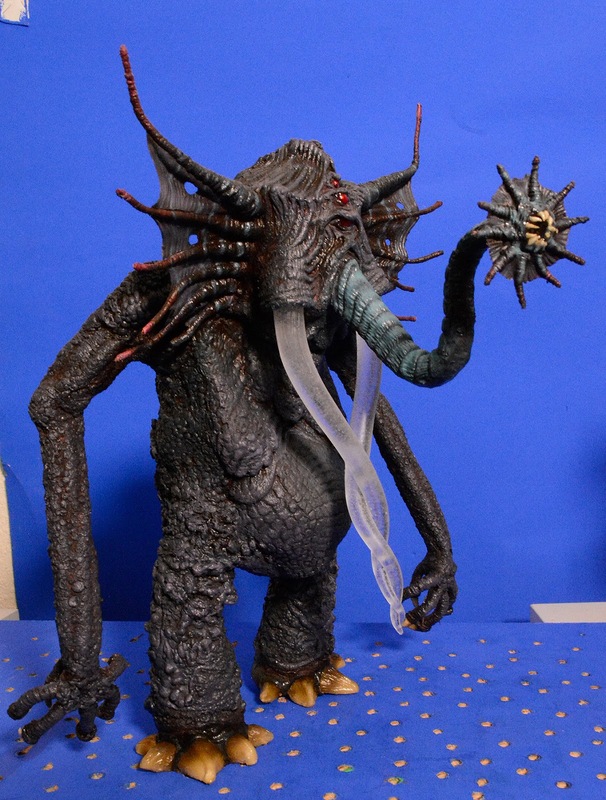 At any rate, I enjoy the works of "Belknapus", and for years I've been thinking about how I could build and animate one of his most famous creations, the cosmic horror Chagnar Faugn. This monstrous being (and others like him) appears as the villain of his novel "The Horror From the Hills", a madcap tale of aliens, horrible transformations, strange archeology and death ray inventions. However, I settled on a poem which Long wrote for Weird Tales, September 1932. 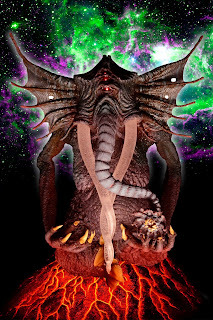 It features Chaugnar Faugn before he comes to Earth, apparently, or may simply be a stand-alone piece of literature. 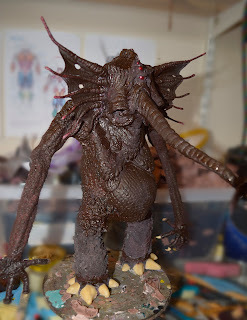 Chaugnar Fagn's appearance is not as abstract as with some of the other Lovecraftian creatures. 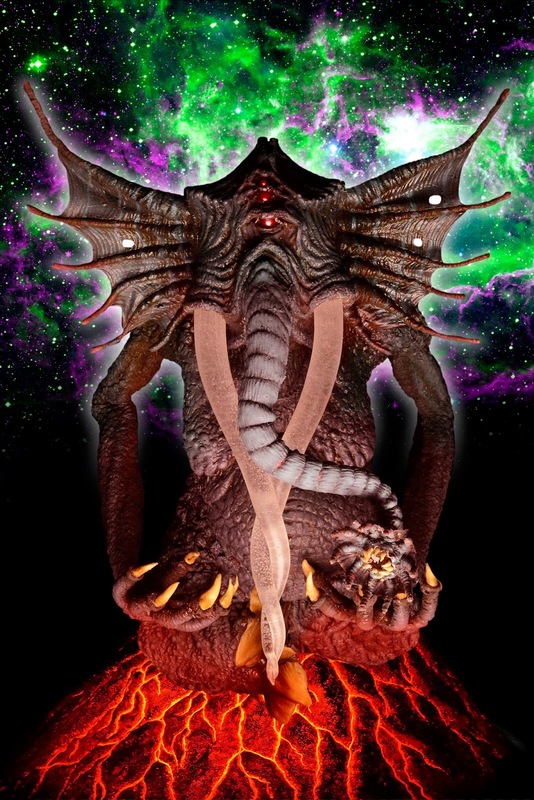 Basically, he looks like an evil version of the Indian elephant-headed deity Ganesha. He has some kind of wings or fins that can be mistaken for ears. 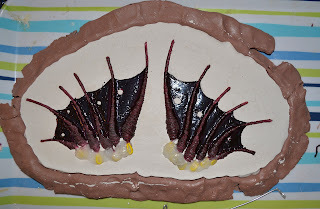 What looks like a trunk is a proboscis with a blood-sucking orifice, and what seems like tusks is a crystalline outgrowth which entwines towards the end of it's length. 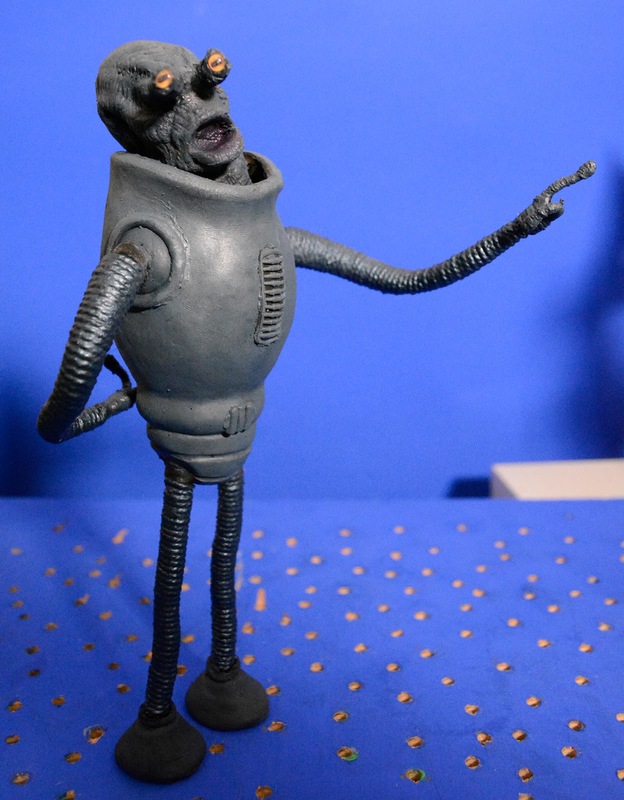 His body is generally humanoid. 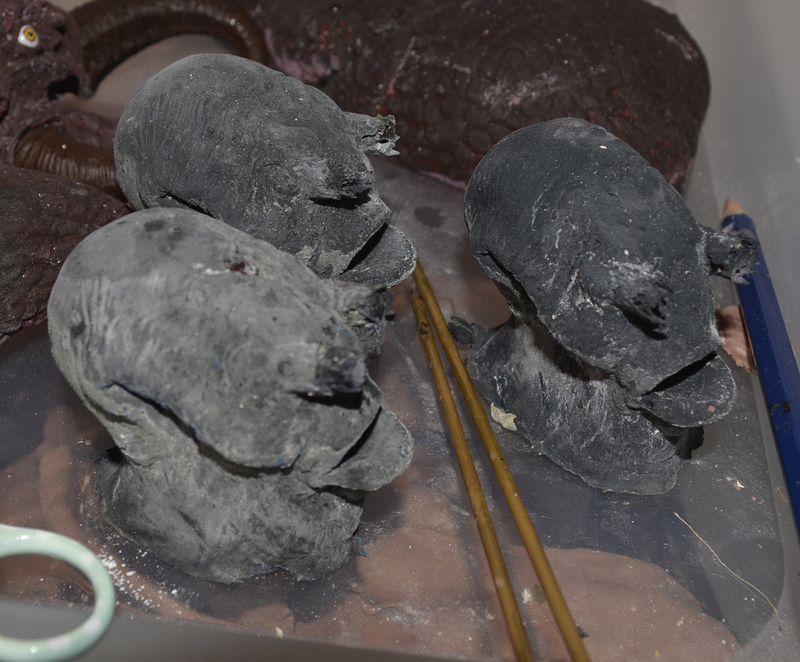 I started with creating these tusks, sculpting them in medium grade monster clay. 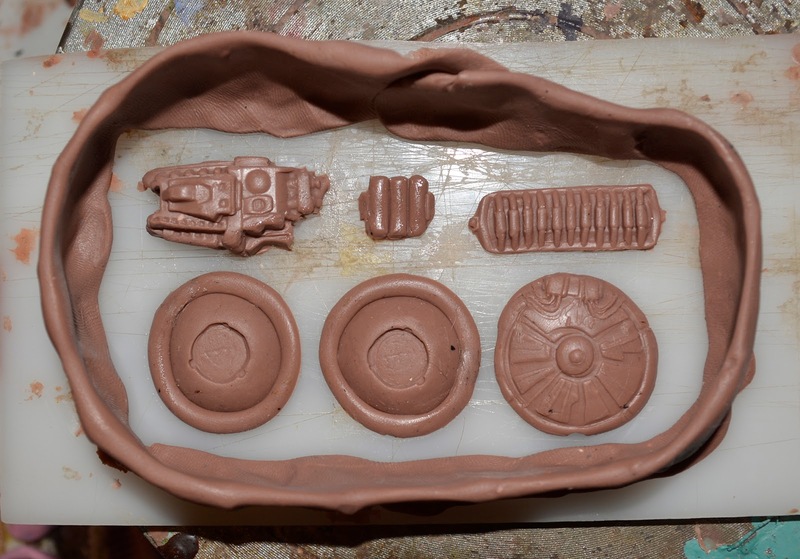 A mold container was slapped together using bits of cardboard and hot glue, into which DragonSkin FX silicone was poured. 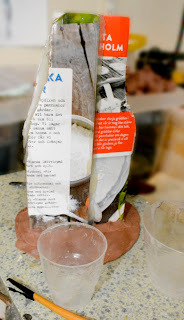 This is how the actual silicone mold turned out (with the cardboard removed). The clay tusks have been plied out after making a cut down what will be the backside of the mold. 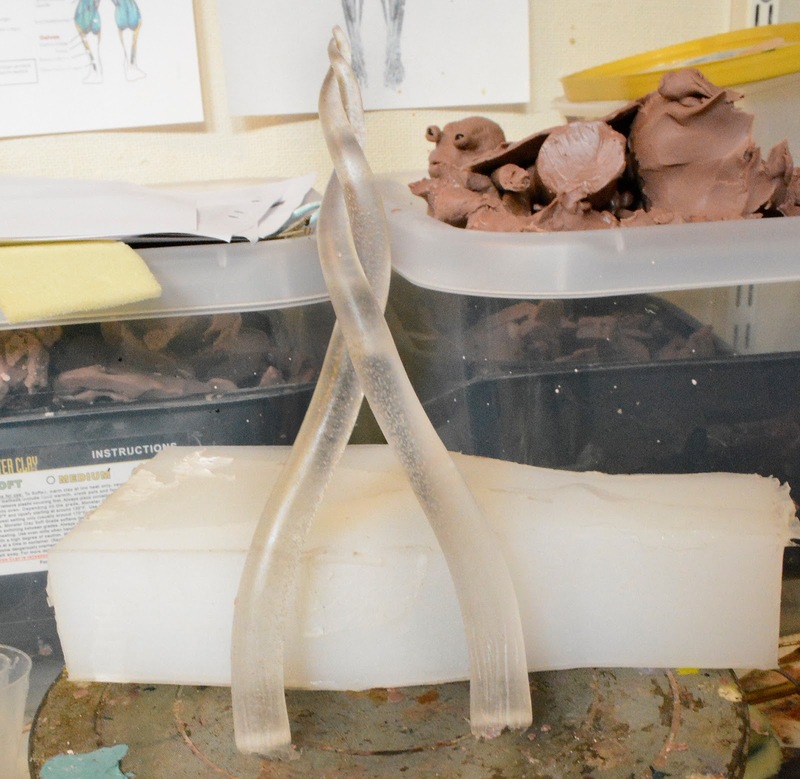 The tusks were cast using Poly-Optic clear casting resin. However, since I didn't have a vacuum chamber to de-gass the material in, all the air bubbles that emerge during the mixing of the stuff was left in. This caused the tusks to become translucent rather than transparent. In my case that was OK, since completely clear tusks would've become invisible as I was animating the puppet against a blue screen for chroma key work. 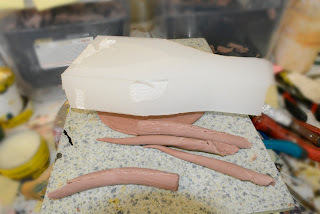 As the silicone mold is pretty thick it snaps tight around the back side cut, and there was hardly any plastic seeping out, creating thin bits of "flashing." 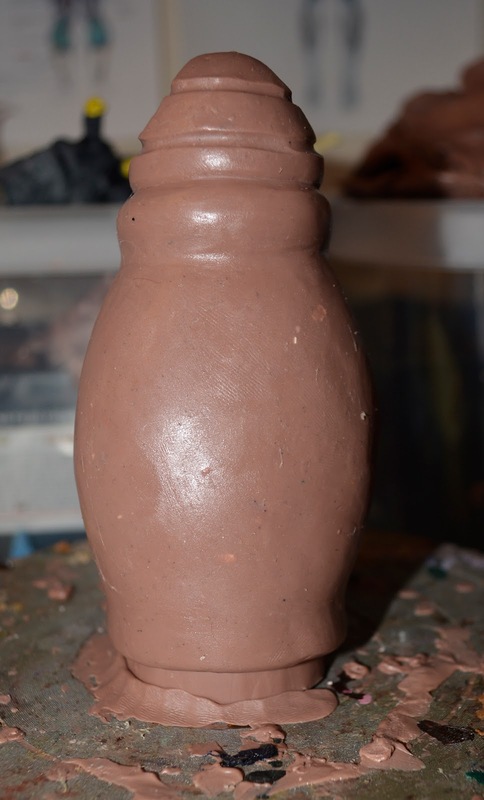 In other words, the cleanup of this casting was minimal. 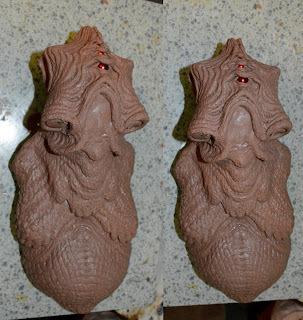 When the tusks were finished I sculpted the head and the front of the torso in medium grade Monster Clay. 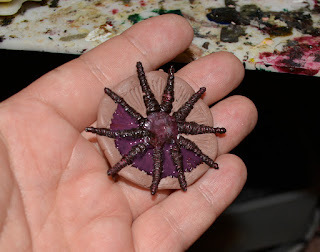 I used the shiny read half-beads that I often use for glowing monster eyes. I probably should come up with a new trick to create eyes, but what the heck -I like it! This sculpture took about two days to complete, spending a fair amount of time adding textures and details to make it all look strange but organic. 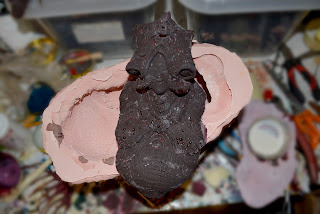 I cast the head and torso with tinted latex from a dental plaster mold created around the sculpture. 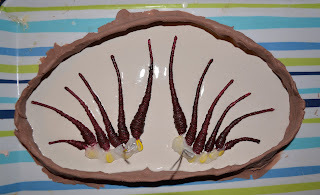 The "ears" (or whatever they are) were made to resemble spiky fish fins using copper wire encased in soft plastic, then wrapped in soft string and covered with tinted latex. 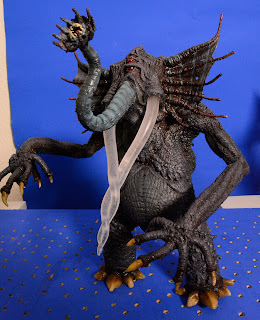 Polymorph plastic was used to hold them together. 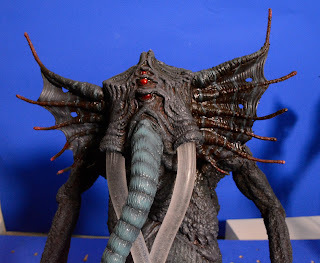 This made the spike bits animate-able, so they could squirm and move in creepy and very un-elephant-like ways. I used my usual trick of adding skin between the moving parts by encasing the whole armature halfway down into an improvised tub of soft hobby plaster, adding more latex between the tentacle bits when the plaster had dried. 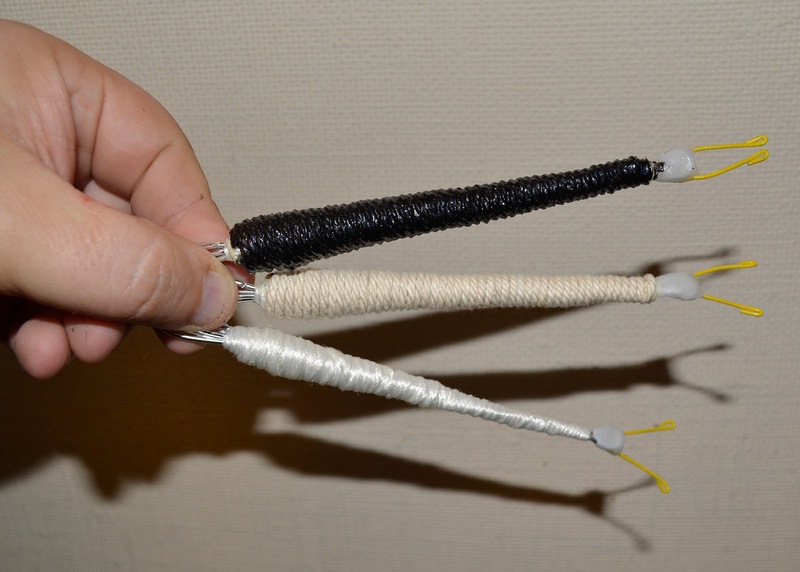 The trunk was made , like most of my tentacly bits, by wrapping soft yarn around a piece of aluminum wire. But I also sculpted a clay trunk, or rather the top side, to give it distinct texture and shape. 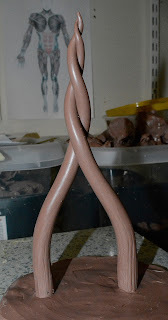 From a plaster mold poured over the sculpture I could then cast a latex skin added over the wrapped aluminum wire. 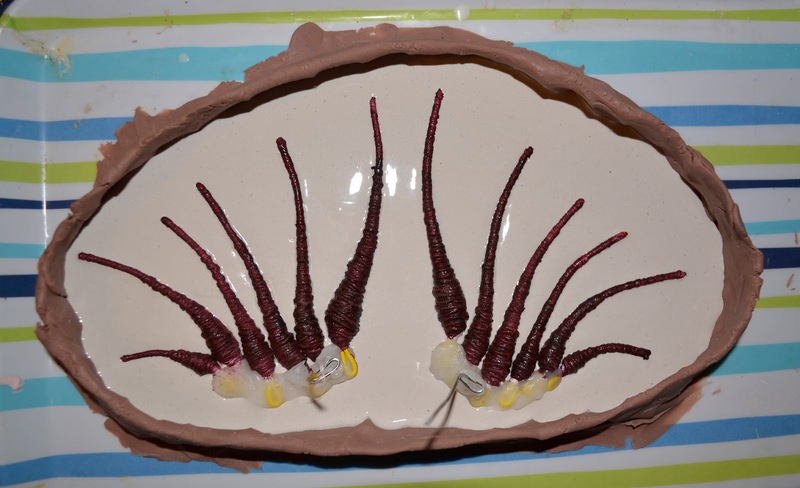 The sucker-like mouth was made the same way as the ears, except for that I used clay to embed the armature instead of plaster. 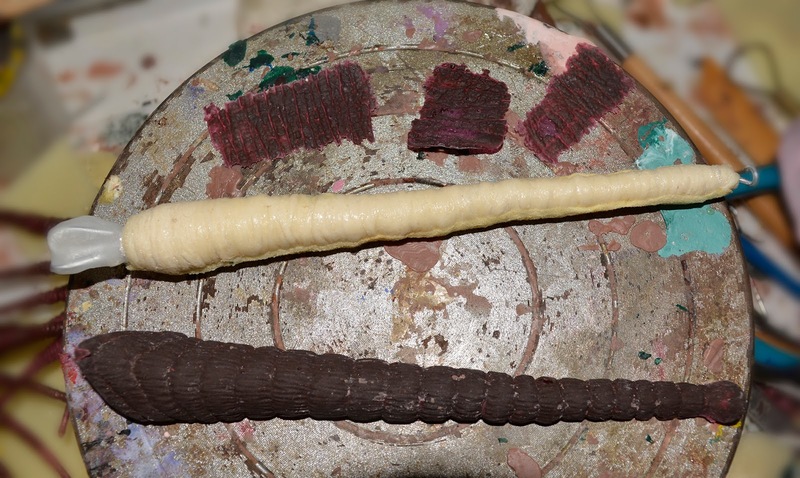 When the desired shape was achieved I built up a round orifice with latex and cotton, and also added latex teeth. The armature was my usual aluminum wire and Polymorph construction. 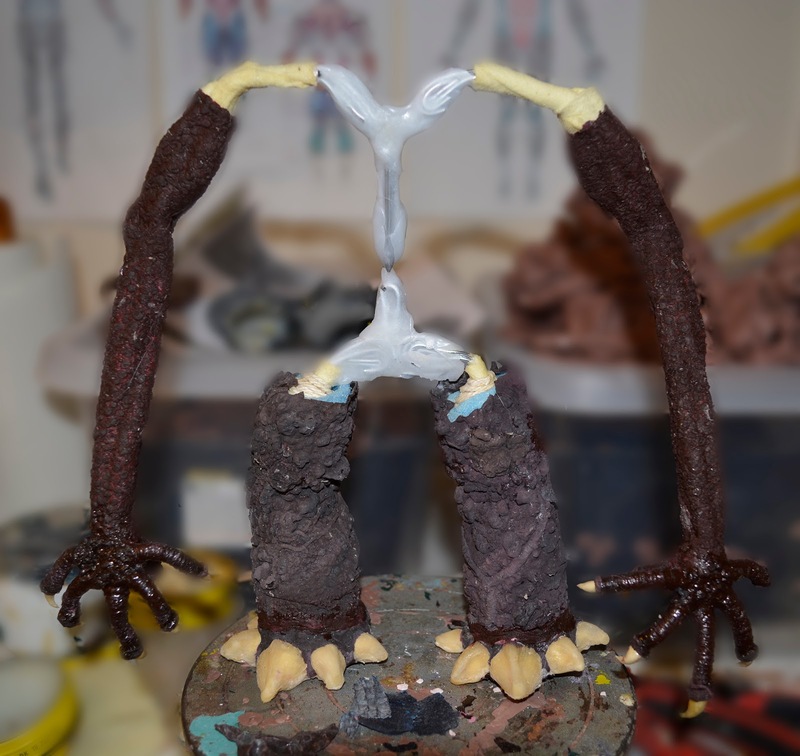 The limbs were covered with muscles created by soaking thin polyurethane foam in latex and rolling up bits of it into long sausages. They were all bonded together with liquid latex, and then covered by extra-extra thin foam to smooth out the shapes. 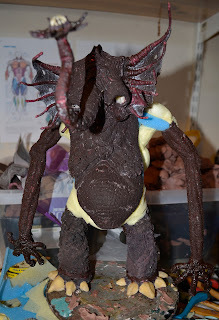 Arms and legs were padded and covered with skin separately and then joined together to form the body. 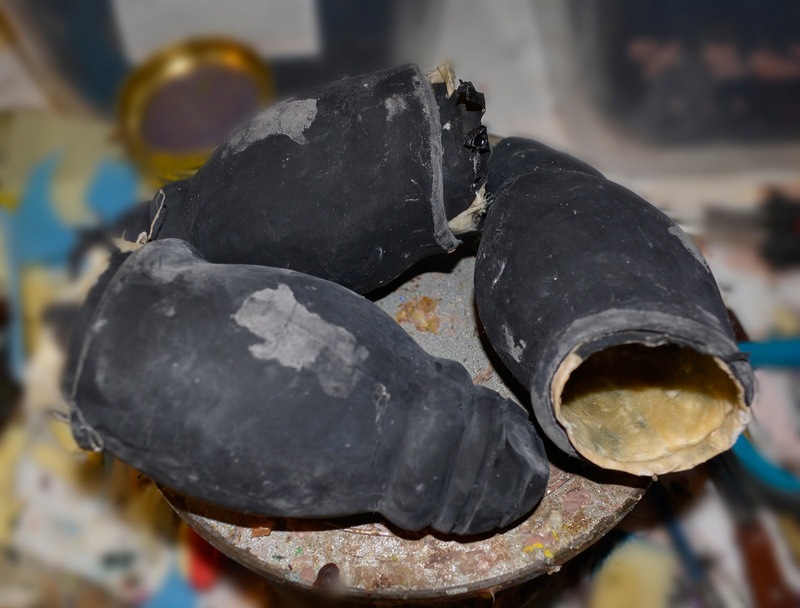 The feet were also cast from clay sculptures. 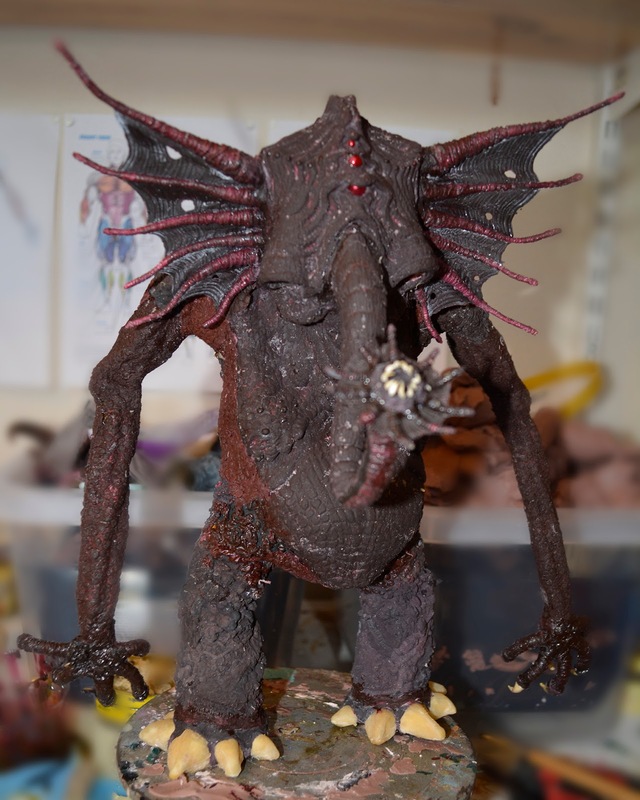 The torso was completed with a head supported by a skull made from Polymorph and the armatured ears and trunk. 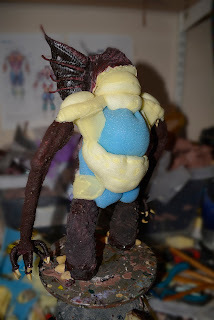 The rest of the body was padded with thin polyurethane sheets covering bundles of cotton balls. The foam bits were covered up with bits of latex skin cast from old plaster molds used for a number of puppets. The puppet was painted with a unifying layer of tinted latex before getting a dry brushing with greenish grey latex. The tusks were simply attached using hot melt glue. They stuck very well to the Polymorph skull that way. The finished puppet is pretty large, around a foot tall. If you started reading this blog post by checking out the video posted at the top you'll know that old Chaugnar isn't the only puppet. He's being monitored by a bunch of aliens with eyes on stalks. 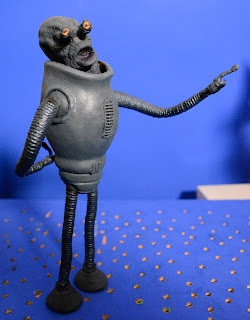 These characters were just the one puppet, made in bits and assembled. 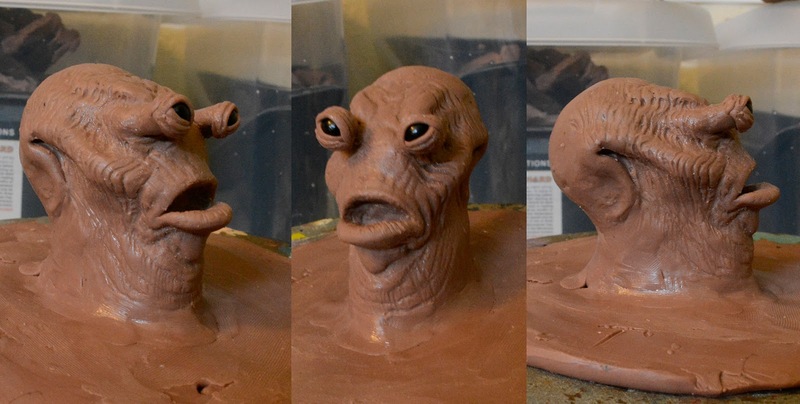 The head was sculpted in medium grade Monster Clay. The body, which is a space suit, was also sculpted in clay, here seen upside down. Originally I had the notion of making three puppets with slight differences, so I cast three heads and three bodies in latex. However, I soon realized that to make them discernible from each other I had to make them more different than I wanted, so in the end I decided to just make the one puppet, representing the whole alien crew. I also sculpted some other bits of tech that would be cast in latex and attached to the spacesuit. 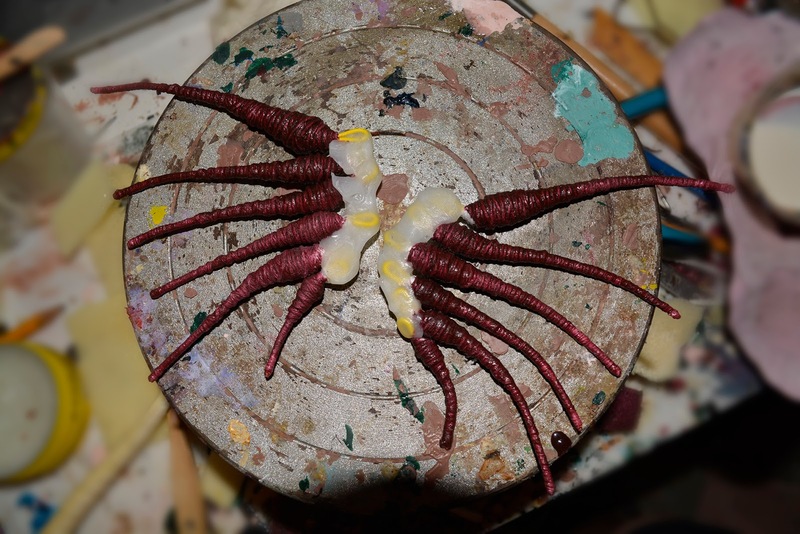 I wanted the arms and legs to be tentacle-like so I made them very simply by wrapping soft string around aluminum wire to build up a shape, and then covering that shape with sturdy macrame yarn, and lastly with tinted latex. 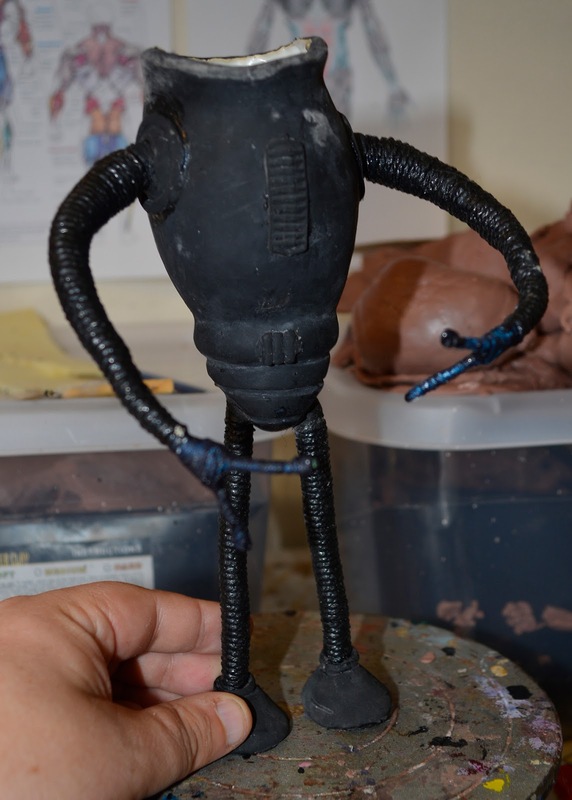 Here's the spacesuit body assembled. And here's how the finished alien(s) turned out with head attached and a greyish metal color added. The eyes are tiny Photoshop print-outs covered with drops of Glossy Accents scrapbooking plastic. 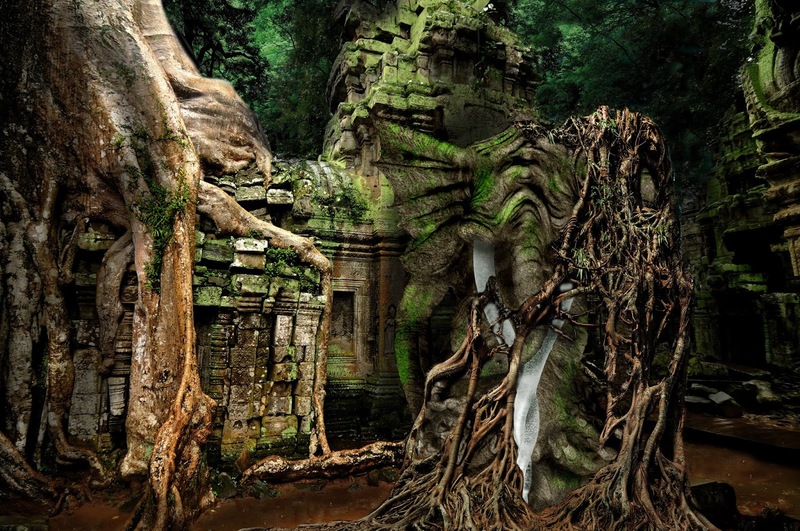 The backgrounds are my usual mix of stock footage, mainly from Videoblocks, where I have a yearly subscription. 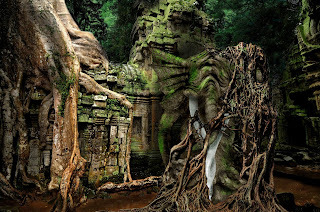 Some backgrounds were made in Photoshop using stock images from DepositPhotos, where I also have a subscription.